Our annual trip to BrightonSEO was another insightful and compelling outing. We attended a training session on paid social advertising the day before the digital marketing conference, which hosted talks about SEO and content marketing. The SEO event also highlights industry changes and topics that are shaping our area of work. What we always find great about BrightonSEO are the actionable tactics and take-away strategies we can implement in our own business and successfully alter the way we approach our business strategy. On the first day, I attended a training course on Paid Social Advertising. Even though I work with social media and the advertising side of our agency, the course was a real eye opener since it gave me a solid sense of the best practices when advertising on Facebook. We covered topics such as Tracking Pixels, Funnels, Ad Types, Audience Development and Ad Setup. Even the chance to see how others handled paid social advertising was a great insight. Ned, our trainer, was full of practical advice and great examples. His informal delivery and step by step instructions on Facebook Pixel made the training both informative and enjoyable, and I acquired the tools and knowledge to improve our in-house advertising strategy. The conference day was equally informative and, if you are one of the lucky ones with a free ticket, I thoroughly recommend attending. There are a variety of talks, each lasting twenty minutes, and you can always learn something from each one. Matt Siltala, who delivered one of the talks, explained the importance of good content and how to drive the marketing behind it for the most effective results. A distinctive phrase he used was the “post and pray” approach, which meant putting out content with no strategy, thereby prompting zero engagement. 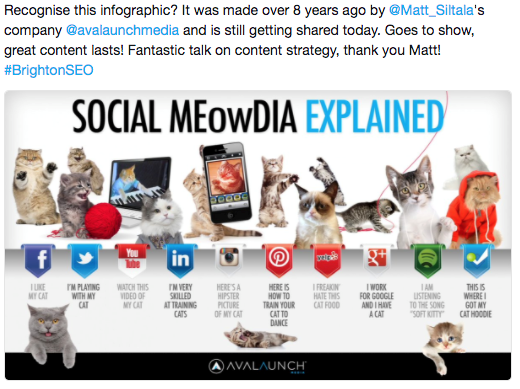 Matt then dove in-depth on how to turn this issue around with an example that had the whole auditorium in laughter; he used a popular topic like cats to create an infographic about Social Media. The content he created is still being shared today because of its memorability and clever execution. I’ve visited the BrightonSEO for the fifth time and it’s amazing to see the event grow each year. It was good to recognise familiar faces on the stage but also get to know other speakers who shared their SEO tips and success stories. The sessions I attended discussed how to optimise websites for better speed performance, the best SEO tools currently available, and ranking factor based on research by other businesses. My day began with a talk from Fili Wiese, who spoke about improving website speed performance. I’d had the opportunity to meet Fili at one of the previous training events, so I was looking forward to his presentation. He delivered a talk that included useful technical tips to make sites load faster, and covered developer issues like website size, image optimisation, as well as altering the server location to increase response time. Another enjoyable session was Christoph C. Cemper’s presentation on twenty free SEO tools for site auditing. Even though I was familiar with some of the tools, there were mentions of new software or browser extensions I hadn’t heard about. Performing a site check can be a challenging and time-consuming task, but there are many great tools in the market to help. Some, however, entail additional costs which raise the expenses for agencies that also use multiple software for better overviews, so I found it helpful to hear recommendations from other experts. During the same session, Grant Simmons shared some knowledge about snippet analysis and optimisation in his interesting “Batman SEO” themed presentation. He explained how to identify gaps between competitors, and fix them to improve rankings. Another talk by Luke Sherran explored video ranking on YouTube. Videos are steadily becoming a more popular format in digital marketing together with the YouTube platform—the second most popular search engine. Over three hundred hours of video are uploaded on YouTube every minute and ensuring a good amount of views can be challenging, but Luke gave us some great tips to improve a video’s visibility. The conference ended with a keynote speech by Rand Fishkin, who talked about SERP as the future of SEO. He made an interesting point about Google improving the user browsing experience and its effect on online businesses and their website traffic. So, will we be going to next year’s Brighton SEO? Absolutely! For us, it repeatedly tops our list of events we want to attend. Aside from the lovely beach views and the chance for a fish and chips lunch, it’s also a fantastic place to meet SEO and digital marketing experts. If this review persuades you to visit the next conference, head over to the official website at BrightonSEO and sign up for a free ticket.